This week, voters headed to the polls to elect leaders in our municipalities, school districts, and other critically important units of local government. Congratulations to all the winners and good luck to all who are either starting or continuing their public service to our communities. Thank you all for your willingness to serve, and we applaud those who were not successful as well. You were all courageous enough to put your name forward and to offer yourselves to make our area a better place. We all commend you for that. We look forward to big things happening in our community, and your State Representative stands ready to help you accomplish your goals. My week at home was spent once again making rounds in the district, touring businesses, and attending events. The Russell Masonic Lodge had a great fundraising breakfast in Georgetown on Saturday. It was delicious and the proceeds went to help the Dyslexia Center, a great charity. I also was able to meet with more local business leaders. Continuing my education on local business is a great way to learn the district and the things that are so critically important to what makes the 104th work. I appreciate each and every single person and group that has taken the time to visit with me. 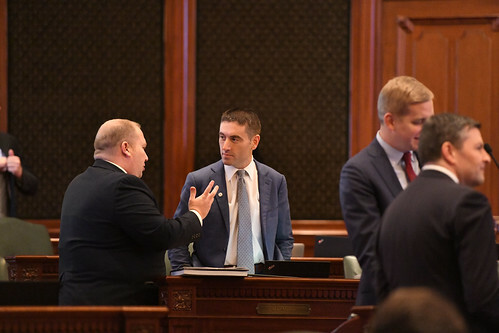 Action in Springfield heated up this week as a large amount of legislation started moving for votes on the House floor. The quantity of bills was very large, and not everything that passed this week was noncontroversial. There were some bad ideas that made it through the chamber, but a very large portion of the issues that moved forward this week would be considered the small stuff. We voted on a lot of technical changes, common sense measures, and smaller legislative issues. I am proud to say that I passed my second bill, HB 2243, which was an update to the qualifications to stand for election to the office of Supervisor of Assessments, Township Assessor, and Multi-Township Assessor. 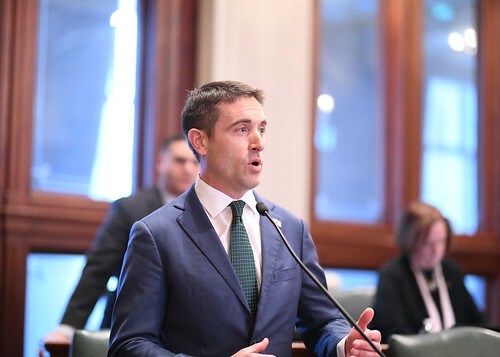 I was proud to work with the County Assessment Officers Association to pass this bill, and I especially want to thank Vermilion County Supervisor of Assessments, Matt Long, for his technical expertise on the bill. One of my favorite parts of being in Springfield is meeting with constituents that take the time to come to the Capitol to let me know about issues that are important to them. This week I was pleased to meet with a group from Champaign County to discuss the importance of infrastructure spending. I met some very impressive young people representing Eastern Illini Electric Cooperative, some great people representing Townships in the 104th, and several outstanding Dentists from Danville and Champaign-Urbana. I appreciate everyone taking the time out of their busy schedules to come and participate in democracy first hand. I promise every time you take the occasion to let me know your views, that I will take them under serious consideration. Even when we may disagree, I value everyone’s input and perspective on issues that affect all of us. I can’t do a good job being your State Representative without your help and input. All in all, it was a good week. Things are getting ready to heat up as we start to talk about the big issues the Governor has proposed. I intend to keep an open mind and will work with the Governor and the Majority whenever I can, but I promise you that I will be a strong voice for Vermilion and Champaign Counties. I do not take lightly the responsibility you have entrusted to me, and everyone in the 104th District will always have my best. We will keep fighting for what’s right, and we will work to do good things for the 104th District. It is up to us to create a brighter future, so let’s stay determined to get that done. Have a great weekend everyone!